It’s the perfect time to start making handmade soap. I’ve put together a wonderful variety of Handmade Christmas Soap Recipes so that you can get started right away in creating gifts that are natural, healthy, and greatly appreciated by family and friends. If you’ve never made handmade soap before, learn how by starting with my 7 Easy Steps to Homemade Lye Soap for Beginners or get my book, The Natural Soapmaking Book for Beginners. These 9 Christmas soap recipes make great handmade gifts. But keep in mind that all of my natural soap recipes are healthy for you and your family. Soap is something that you slather all over your skin every single day. It’s worth the effort to make sure that you use something pure and healthy, not to mention non-drying. 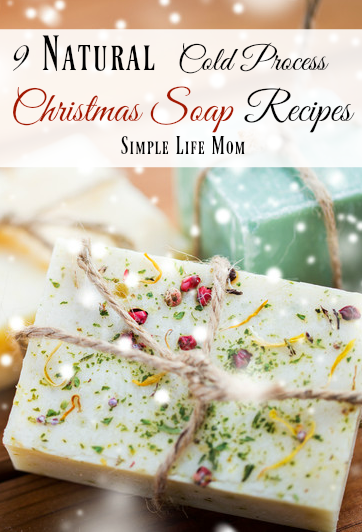 If you’ve looked through these and want to check out more, head over to my other article: 7 Homemade Holiday Soap Recipes. Makes 3 pounds or 12 – 4oz bars. Combine oils, lard, and butters in a large pot and heat to 110 degrees Fahrenheit. Wearing appropriate safety equipment, go outside and add lye to water and stir until dissolved. Let cool until it is around 110 degrees Fahrenheit. When both oils and lye water are at desired temperatures, pour lye water into oils and use a stick blender to blend on and off until very light trace. Remove 1/2 cup of soap and mix in cinnamon. Pour main batch into lined mold. Pour cinnamon soap over batch in a back and forth motion. Use a dowel rod to swirl cinnamon color into soap. Insulate for 24 hours. Remove, cut, and cure for 4-6 weeks. Combine oils and butters in a large pot and heat to 110 degrees Fahrenheit. When both oils and lye water are at desired temperatures, pour lye water into oils and use a stick blender to blend on and off until light trace. Add essential oils and blend until combined. Remove 1/2 cup of soap and mix in spirulina. Blend until combined. Pour main soap batch into lined mold. Pour green soap down the middle of the batch in one long line. Take a dowel rod and stick it into the middle of the mold. Pull toward the side and lift it out. Repeat this on both sides of the green line, making a tree pattern. Combine olive, coconut, and castor oils in a large pot and heat to 110 degrees Fahrenheit. Combine the coconut, olive, castor, sweet almond, and grapeseed oils and shea butter in a large pot and heat to 110 degrees Fahrenheit. Add essential oils and blend. Combine lard, coconut oil, cocoa butter, and sweet almond oil in a large pot and heat to 110 degrees Fahrenheit. If desired, take out a cup of soap and add 1-2 tsp of cocoa powder. Pour main batch into mold and swirl cocoa soap back and forth over the top. Take a dowel rod and swirl cocoa stripes in circles for a pretty design. Combine olive, coconut, and casotr oils and shea butter in a large pot and heat to 110 degrees Fahrenheit. If desired, take out a cup of soap and add 1 teaspoon of cinnamon powder and mix until there are no lumps. Pour back into main batch and combine. Pour into mold and insulate for 24 hours. Remove, cut, and cure for 4-6 weeks. Combine tallow and coconut, sweet almond castor, and jojoba oils in a large pot and heat to 110 degrees Fahrenheit. Add essential oils and turmeric powder and blend until combined. Turmeric will start off orange but will fade during saponification to a gingerbread tan color. Combine coconut oil, olive oil, casotr oil, shea butter, sweet almond oil, and grapeseed oil in a large pot and heat to 110 degrees Fahrenheit. Combine tallow, olive oil, and coconut oil in a large pot and heat to 110 degrees Fahrenheit. Make tea using the chai tea bag. Use some of the water for your lye water. Save the tea leaves for the soap. Add essential oils and tea leaves and blend. Enjoy these 9 recipes, share with your family and friends! 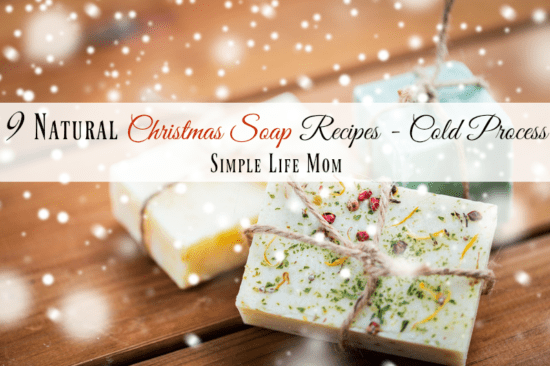 Want more Christmas soap recipes? They all sound so good, thanks for the recipes! Just a quick question. In the Autumn Leaves soap, the directions list tallow and oils but the ingredients list does not mention tallow. Was it left off the ingredients or were the directions a copy and paste error? Thanks. It’s an error. I did copy and paste the directions instead of writing them out every single time. Thanks for catching that. I’ll make the edit now. Another question. I happen to have some tallow I made, but no lard. Are they interchangeable? Thank you for being so generous and sharing these recipes with your readers! I have all the ingredients to make soap, but have been a bit timid about actually DOING it! Maybe these wonderful recipes will make me take the plunge! Go for it Carol! 🙂 You can do it! I have your book the Natural Soapmaking Book for Beginners. I have a question about the instructions for adding natural colorants on page 30-31. For instance for Alfalfa oil infusion you say 1/2 ounce in place of olive oil in recipe (amount per lb of soap). Does that mean I would reduce the amount of olive oil by 1/2 ounce and add 1/2 ounce of alfalfa powder? Do I add the alfalfa powder to the olive oil and mix before adding other oils and heating? If you don’t want the whole batch to be one color–if you wanted to do a swirl–would you add the powder to part of the soap batter at trace instead of in the olive oil? Yes, you would reduce the amount in the recipe and replace it with the colored oil you have prepared ahead of time. You can add powders at trace to partial or whole batches. The difference is that some colors aren’t as bright when not infused in oils ahead of time, especially greens. They’re pretty at first and fade very quickly when curing. Great post, thank you for sharing! What are the additives in your soap picture at the beginning of this post? It’s very beautiful and festive. It’s a combination of dried flowers sprinkled on top after pouring. Yes they do. Certain scents do fade faster than others (over months, not days), but by combining them with other oils of a different tone (deeper, lighter) you will insure that they last longer.